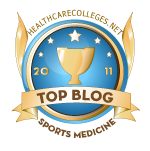 Natural Sports Medicine Blog: Athletes And Their Rituals - Sound Strategy or Simply Superstition ? Athletes And Their Rituals - Sound Strategy or Simply Superstition ? 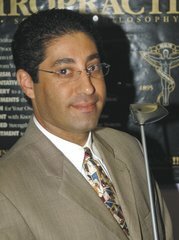 As sports sports medicine physicians we get to see this all the time. Rituals athletes go through in the time leading up to & during a competition. Tiger Woods is well known for (amongst other things now) wearing a red shirt on the final day of competition. Baseball players put on their "rally caps" when trying to change their luck and start a batting rally. Other athletes make sure they wear their "special" underwear, socks, hats, shorts etc, etc, etc. Runners and other sports involving running, then it's all about the sneakers buying many pairs of the same sneakers just in case they change or discontinue the model. In general, athletes will go through a specific ritualistic routine - the same one each and every time. Some of this may seem like head games or just psyching themselves out but maybe there's something to it. This past weekend I was invited by the Miami Beach Rotary Club to be a part of their Sprint Triathlon Men's Relay Team and do the swimming leg of the competition. Since having done my first triathlon about a month earlier, I caught the "triathlon bug" so of course I was going to do it. The race went off without a hitch. This time I was a bit more aggressive in the water and cut my 1/4 mile time down by 45 seconds. The rest of the relay-tri team did pretty well as we ended up taking 1st place in the men's relay. A few other friends were doing the triathlon that day and I met up with one as we were cheering on the other racers as they Finished. I had an interesting conversation that led me to believe there may be a very good reason for these rituals. One of my good friends (let's call him Mike) a very experienced marathoner and triathlete came up to me after the race. Looking a bit more pale that I would have expected from an athlete with his experience and training I was surprised by what he told me next. Mike told me something strange happened to him during this triathlon. He has done dozens of these and never had a problem until now. He came out of the swim just fine, transitioned into his bike and while on the bike he ripped open a Hammer Gel for some added fast acting and ready to use carbs to fuel his cycling. As he came back into the bike to run transition he felt very strange. Light headed, strange feeling in his chest as his heart was racing and he had no energy, almost feeling "sick". He said he felt like he had run out of gas. Had he not been such an experienced athlete I would have just thought it was lack of race prep & training or over exertion, poor hydration or maybe he just wasn't ready for the race. But this was a sprint triathlon and he was too experienced, so I started asking him what was different about this race. We spoke for a few minutes about his training over the past couple weeks, his quality and quantity of sleep, his diet and nothing seemed to have changed. To me it sounded like how I feel if I happen to have a cup of regular coffee (except I also get jittery) including the crash after the caffeine wears off; and I told him so. Just then he said he took the hammer gel from the race "'goody bag" during the bike portion of the triathlon, telling me it was the Hammer Gel Espresso. 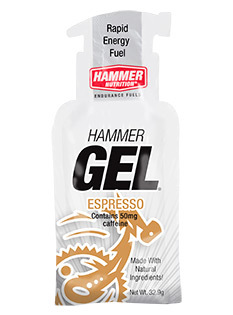 Not thinking it was different from the other Hammer Gels he had taken in previous races, the Hammer Gel Espresso contains 50mg of caffeine. Mike didn't realize it and said he is sensitive to caffeine. Upset stomach, acid reflux, etc. None of which is what you want to feel before, during or even after training or a competition. So now Mike knows one more component of his race ritual: Be careful of what you put in your mouth. Know your food, know your fuel. Amongst other things, now Mike is going to be reading labels more carefully because he knows how sensitive he is to caffeine and how it effects him during competition. Now he has one thing he needs to be ritualistic about - No Caffeine. 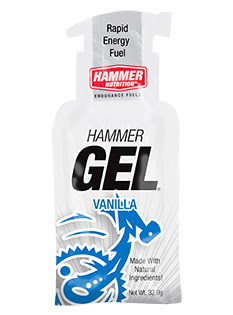 I used the Hammer Gel Vanilla during my previous race . I actually love the stuff and most of their gel fuels do not have caffeine. It worked well in my first triathlon but I knew to double check for caffeine or other stimulants. because the typical race "GU" sold out there does have caffeine and I know how that effects me so I specifically look out for it. I personally love Hammer's race nutrition and their philosophy behind how they make their products. Like anything else, some are good for some people and not for others. It's up to the athlete to know themselves and their needs. I found Hammer specifically because of their natural ingredients and a large selection of race fuels that do not contain caffeine or artificial anything. A pre-race or pre-competition ritual in a case like this can be a very good thing. In the future it will keep Mike safe, healthy and competing at his best. The moral of this story is know yourself and your needs and make a routine that works for you. If you have allergies or sensitivities you need to check and re-check the ingredients on the stuff you use. Know if it goes by other names. Are you on medications? Check with your physician or pharmacist if your medications have any interactions with your race nutrition BEFORE you run into problems. Or, don't pay attention to your nutrition and give the local paramedics something to do at the race. How much caffeine is actually in coffee? Unlike soft drinks or foods with set caffeine levels, there is no set concentration of caffeine in coffee. Different varieties of coffee beans contain different levels of caffeine. Arabica beans range from 1.2% to 1.8%, Robusta beans can reach as high as 2.4%, and some relatively non-commercial beans such as Excelsa (aka Chari) can have almost no caffeine at all, making them a perfect component for naturally low-caffeine coffee bean blends. Also, many processing factors can increase or decrease the amount of caffeine in coffee. See the table below to see a comparison of the amounts of caffeine in various type of coffee and other products. Note: These are averages and do not reflect specific teas or chocolates, nor are they adjusted for brewing times, etc. They are presented here just as a rough comparative guide.) Sources: USFDA and Nat. Soft Drink Assoc. Guess Who Else Has a Sweet Tooth??? CANCER!! !